At its meeting on Feb. 19, the Indiana State University Board of Trustees declared its intent to issue the bonds and reimburse the university for pre-construction expenses related to the expansion and renovation of the Health and Human Services Building set to begin this summer. 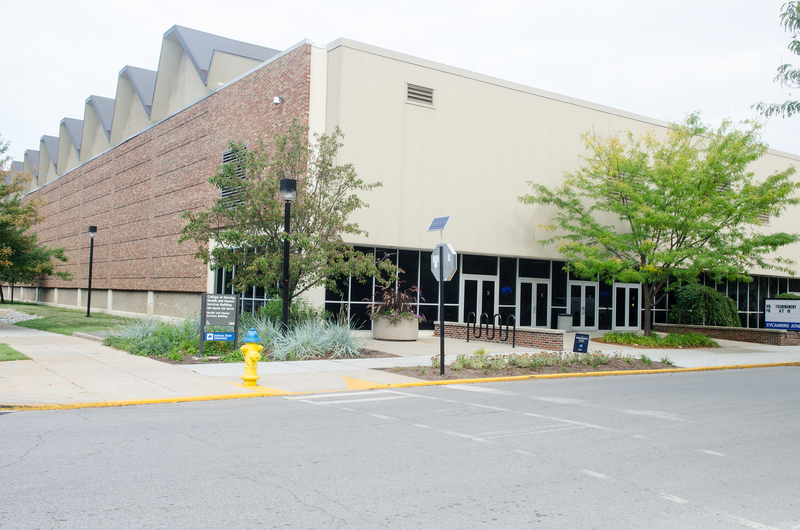 In preparation for the construction at the former Arena Building, a main sewer line and bike trail along Fourth Street from Chestnut to Tippecanoe streets must be relocated. State legislation passed last year allows the university to issue up to $64 million in student fee replacement bonds to finance modernization of the building constructed in the 1960s. Work will include major upgrades to improve temperature control and air quality in the building as well as technology improvements. Interior space will be reconfigured to enable academic programs to function more efficiently The project also includes an 87,000-square-foot expansion to house new academic programs and accommodate existing programs now housed elsewhere on the Indiana State campus. The plans were approved by the Indiana Commission for Higher Education on Feb. 11 and now go to the State Budget Committee for final approval before bids can be let this summer. • Heard from President Dan Bradley about ongoing efforts toward advancing diversity and inclusion at the university, including a recommendation to elevate the position of special assistant to the provost for inclusive excellence into a cabinet-level position with the title of associate vice president of academic affairs for inclusive excellence. • Were updated on departmental success plans and the development of the new strategic plan. • Approved parking violation fees, including a $300 fine (previously $125) for being in possession of an altered or stolen parking permit and $55 or the current price, whichever is lower, (previously the price of the parking permit) to replace a lost or stolen permit. • Approved the Virtual Instruction Certificate Program in the Bayh College of Education for the fall. Online learning in Indiana has increased by 13 percent from the 2012-2013 to the 2013-2014 school terms, not to mention the supplemental online offerings Indiana institutions offer. • Approved a schedule of course-specific fees effective with the fall semester. • Approved changes to the University Handbook that had previously been approved by the Faculty Senate. • Approved changes to the Staff Council By-Laws that had previously been approved by Staff Council. Photo: http://photos.indstate.edu/Campus-Scenes/Buildings01/Arena/i-RcNZFgr/0/X3/August%2028%2C%202014arena%20south%20gym5529-X3.jpg - Indiana State University's Health and Human Services Building is in line for a $64 million renovation and expansion.